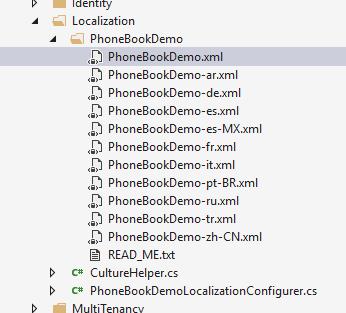 Let's begin from UI and create a new page named "Phone book". AppNavigationProvider class defines menus in the application. When we change this class, menus are automatically changed. Open this class and create new menu item as shown below (You can add it right after the dashboard menu item). Every menu item must have a unique name to identify this menu item. Menu names are defined in AppPageNames class as constants. We add a new constant: "PhoneBook". A menu item should also have a localizable shown name. It's used to display menu item on the page. L("PhoneBook") is the localized name of our new menu. L method is a helper method gets a localization key and simply returns a LocalizableString object (see AppNavigationProvider class). url can be a URL (it's URL of an MVC Action here) that will be redirected when we click the menu item. Lastly, icon is the shown menu icon for new menu item. It can be a css class. We can use Glyphicon, Font-Awesome or another css font library here. See navigation document for more information on menu definitions.